Before starting i want to u to first of all imagine,what was the education system. One of the first easy observations regarding digital technology and education is that online schools and classes are becoming widely available. Even free online classes called “MOOC’s” otherwise known as Massive Open Online Courses are becoming widely popular. young Old to unite from all over the world at any given moment, and to have easy access to a course or program from home. has number of apps namely E-Learning Compliance (ELC), Profiles, Faculty Productivity, Community Service Learning, Grant Management, Conflict of Interest, Mentor and Track & Internal Competition which are really very useful for Universities and Colleges. provides platform to let faculty easily describe all their teaching, research and service activities. Furthermore, it made these activities available online, for other faculty, students, industry and community partners, to easily search and find. It helps improve your compliance management. You can use ELC to track and stay on top of your professional licensure and state authorization compliance. Slice and dice your student enrollment data with direct integration with Student Information System (SIS). teachers now have more ability to personalize lessons, instructions, and projects for each group or child. By using devices and programs to distribute classwork and assignments, teachers can personalize lessons and focus on the work of each student. Individualized lessons can be provided to each student, and learning tools enable students to work, perform, and excel at their own pace. Teachers can also now provide feedback, grades, and reports directly to students through online platforms, and online school portals and log-ins. Collaboration and Peer-to-Peer Learning in the Classroom: With an increase in access to online learning, whether part or full instruction is provided online, increased opportunities for students. To collaborate together from a variety of places becomes possible. Student bodies, in turn, can be made up of students from all over the globe, with every continent represented. 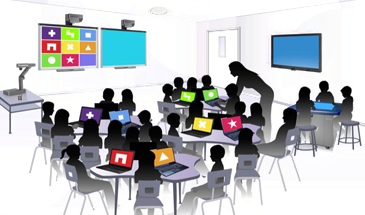 Educational technology as technological tools and media that assist in the communication of knowledge, and its development and exchange. This is usually what people are referring to when they use the term ‘EdTech’. Technology itself as an educational subject; such courses may be called “Computer Studies” or “Information and communications technology (ICT)”. Now i arrive at the conclusion of this topic,i have done a research on this topic and taken help of many website and created a content for u all. If used wisely. I think sometimes we should just leave technology out of the early grades so that kids are learning math and language without a crutch. A lot of my high school students did not know the multiplication tables with the automaticity earlier generations did, which is a problem when you get to higher mathematics. Forget spelling without spell check. Even when using technology in higher grades, there are so many things you to be aware of as an educator.